I believe this dates to either the 19. th century or the early 1900’s. This piece is superb and beautifully carved, also quite large in size and heavy. I am unsure of the type of wood it is carved from, however it feels very heavy and looks quite dense. 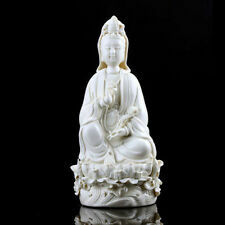 Chinese Dehua White Porcelain Sacred Guan Yin Kwan-yin Goddess Statue. Dispatched with Royal Mail Signed For® 2nd Class. I believe that Honesty and credit standing is the best policy. You will get response within 24 hours. we are very glad to help you. Material: Wood. Size: Wood Board Size:7 4.5 1.2cm/2.8 1.8 0.5". Also note that monitor settings may vary from computer to computer and may distort actual colors. I will bring you high quality service. I hope you can see the details. China Original. Age Region Of Origin Original. Type Primary Material. Making Process : Genuine h andmad e. Weight: 131g. We collect the folk fine art from China. Making Process: Genuine handmade. W eight (g): 380g. Making Process: Genuine handmade. Region Of Origin： Original. Antique Chinese Blanc de Chine, Kwan Guan Yin Porcelain Statue 12"
I believe that Honesty and credit standing is the best policy. SHE IS 500 GRAMS IN WEIGHT AND IS MADE IN BRONZE EFFECT RESIN THAT IS REALLY EYE-CATCHING. SHE IS ROBED, WITH STRIKING HAIR AND APPEARS TO BE HOLDING A RELIGIOUS OBJECT IN THE SHAPE OF A RAMS HEAD. SHE IS IN VERY GOOD CONDITION. Material: Bronze. I am quite glad to help what I can. Material: Dehua Porcelain. Size: Height 32 cm. Length 20 cm. Breadth 19 cm. Condition:Very Good. You will get response within 24 hours. we are very glad to help you. Antique wooden Guanyin Statue, 104cm high. A weather-worn wooden statue with terrific character. Quartz inlaid eyes still present. Fine Chinese Woodcarving Statue of Guanyin, 61cm high. Original China Sculpture. Fine Chinese Woodcarving Statue of Guanyin, 61cm high. Beautifully carved sculpture of Guanyin. 61cm high x 16cm wide x 14cm deep. Fine carving of her hair and gold to skin areas. You will get a response in 24 hours. We take the weekend off. And we will do our best to solve the problem and give you a satisfying answer. Material: Tibet Silver. My all item are not antique ,They are all art. The photo was screened in nature condition. To the real item and you can justice this item factually. 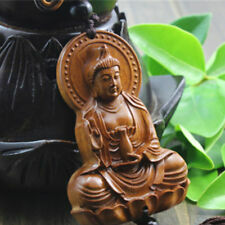 100% natural grade A jade stone hand carving "laughing buddha" statue/pendant. It is made of grade A jade stone and is good for collection. The pictures show the front and back sides of the statue.The carving is excellent handcrafted and well polishes. High collection or as a gift to your friend! Materials: bronze. Also note that monitor settings may vary from computer to computer and may distort actual colors. Condition: Good condition. I am quite glad to help what I can ! THE PHOTOS ARE DONE BY A MACRO LENS TO SHOW THE THEY CONDITIONS & QUALITY. Material: Tibetan Silver. #2, Neutral. I am scared to see low DSR rate or Neutral. If you find any quality problems when you receive the item(s) from us. I will resolve it for you in 48 hours. My all item are not antique ,They are all art decoration. Region Of Origin：. 3.2x3.8x9.0 (long x wide x high). Art is the human best interpretation of beauty.